DIAVOLO | Architecture in Motion, performing “Fluid Infinites” in 2013. The Valley Performing Arts Center is partnering with Ford Signature Series to present L’Espace du Temps performed by Diavolo in September. Diavolo uses dance to explore the relationship between the human body and its architectural environment. The diverse team of dancers, designers, choreographers and engineers, create visceral and awe-inspiring works that reveal how individuals are affected emotionally, physically and socially by the spaces they inhabit. The dance company will participate in a three-part residency over six months. They will arrive on campus on Monday, Aug. 31, to host an audition for the Diavolo Master Class. Over five days, Diavolo will appear in a series of performances, interactive experiences, academic programs and pop-ups around campus, including performing in the Sierra Quad at 11 a.m. on Sept. 1 and 2. The Valley Performing Arts Center is partnering with Ford Signature Series to present L’Espace du Temps performed by DIAVOLO | Architecture in Motion, choreographed by the company, under the direction of Diavolo Artistic Director Jacques Heim on Saturday, Sept. 19, and Sunday, Sept. 20. Now in its third year, the Ford Signature Series pairs Los Angeles County artists with world-renowned performers in one-of-a-kind presentations. 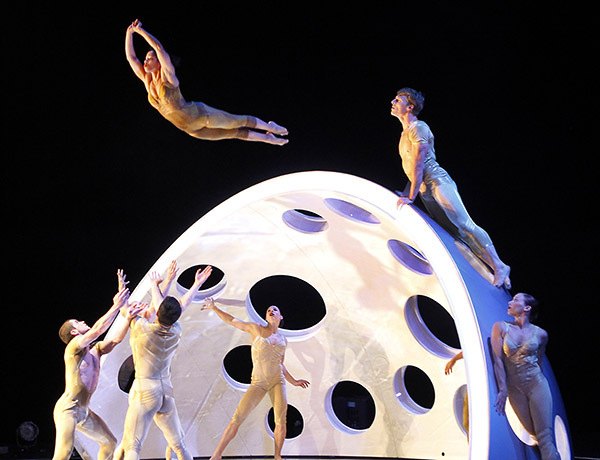 Diavolo performed L’Espace du Temps in summer 2014 at the Movimentos Festival in Wolfsburg, Germany. The performance at VPAC will be the first time that the trilogy will be performed in the United States and with live orchestral accompaniment. Works by Philip Glass, John Adams and Esa-Pekka Salonen will be performed by the New West Symphony and conducted by Los Angeles conductor Christopher Rountree. He is the director of Wild Up, Los Angeles’ modern music collective. L’Espace du Temps began as three individual pieces commissioned by the Los Angeles Philharmonic for the Hollywood Bowl: Foreign Bodies (2007), set to the music of Salonen; Fearful Symmetries (2010), set to the music of Adams, and Fluid Infinities (2013), set to the music of Glass’ Symphony No. 3. This American premiere of the full-length version is made possible by a re-orchestration of Salonen’s score, scaled to fit the ensemble in VPAC’s orchestra pit and to use instrumentalists who play in the other two pieces. Rountree, who is also a composer, will oversee the scaling down, with Salonen’s approval. Rountree and Wild Up have performed at Green Umbrella, the LA Phil’s contemporary music series founded by Salonen. For more information about Diavolo’s scheduled performances at CSUN, contact Terence McFarland at (818) 677-8830. For ticket information, visit the Valley Performing Arts Center or call (818) 677-3000.